I rolled on the bed as I usually do when I wake up. I was still trying to figure out where I was. I noticed I was still very tired and wished I had more time to rest. I heard a knock on the door of my hotel room and then came Mike’s voice whispering “…Ifeatu, we have to go”. Oh my goodness, Mike is at it again I said to myself. He should have at least waited till 8 am before we leave here knowing fully well the journey from the Liberian border at Bo-Waterside to the Sierra Leonean border with Guinea at Kambia where we were at the time was very stressful. We checked into that hotel at around mid-night and barely a few hours later, he wanted us to leave. The journey of the previous day was a very long and tiring one. We got to the Liberian Sierra-Leonean border at around 6am the previous day but we were informed work starts for them by 7am so we had to wait. 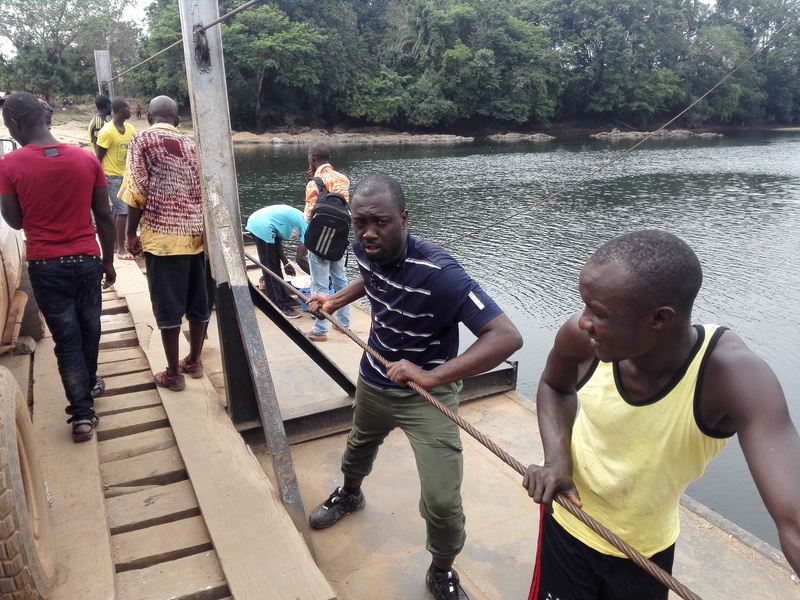 We had no problems crossing especially for Mike who is American and had applied and had gotten a visa for Sierra Leone. I was delayed for some time as the immigration officers wanted some money from me due to the fact I was using an ECOWAS passport issued in Nigeria. All over West Africa, even though the authorities established a free movement of citizens within the region, the immigration officers there often requested for ‘stamping fees’ as they call it each time you crossed any of the borders. However, sometimes, the immigration officers in some border towns have waved it for me either because they see I travel often or some other reason I do not know. At the heat of the conversation if I would pay this ‘stamping fee’ or not, Mike walked in. One of the things I have enjoyed travelling with Westerners (Europeans or Americans) within West Africa is that when you are on a trip with them, the immigration officers most times over look these fees. Mike walked in the midst of the argument when the female immigration officer who was trying to teach me African culture and why I must give her some money. According to her, that in our African culture, if I as a visitor come to her house, I should bring a gift. I corrected her by telling her it was the other way round, that the person who offers the gifts is the host. It was a mild argument though but Mike’s timely appearance prevented further escalation of the matter. She stamped me in and I now wanted to discuss some nice things women like – food. She told me of several meals in Sierra Leone I could try before leaving. I thanked her and we left. We were Dakar bound, in fact, we were meant to be in Dakar the next day, hence we needed to get to Guinea that day or the next one. We planned to get to the Sierra Leone-Guinea border at Kambia that evening and continue to the Conakry the next morning. The journey to the border town of Kambia was in two different parts. 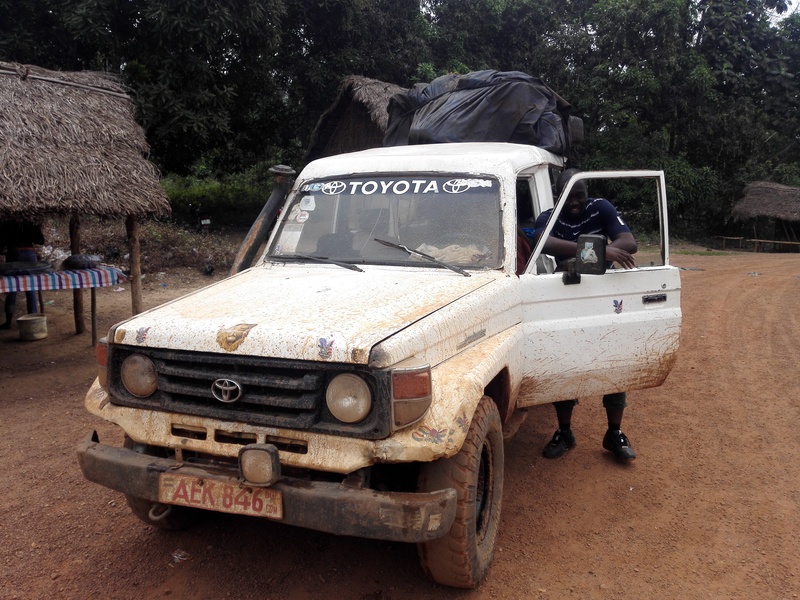 First, we will have to take a shared taxi to Bo, a city in Central Sierra Leone and then from there to Kambia. We were warned before-hand that the journey to Bo would take us around 7 hours due to bad roads. The journey costed us about 90,000 (ninety thousand Leones) which is roughly 10 US dollars. We waited for another 2 hours or so for the bus to get filled up and afterwards we left. Ferrying across a River in Sierra Leone. We travelled on a 4×4 old model range. It was very strong and at the end of the journey, it made perfect sense to me why that choice of vehicle was made by the driver for that route. In the 4X4 with Mike and Kille. The road was very bad like we were advised. There were several immigration stops on the road. At a point, we needed to ferry our vehicle across a river. It was a very wonderful experience for me. I also sat with very nice people and we discussed current issues they were facing as a country in Sierra Leone. I was actually impressed with government welfare package for their employees. The had a minimum wage of 600,000 Leones (85 US dollars) and a bag of rice per month for each employee. This was as at February 2017. We also talked about politics, religious and ethnic divides in the country, opportunities for investment especially in real estate and landed properties and several other things. All these excited me and really made me want to visit the place a second time. We arrived Bo at around 5pm in the evening, making the trip almost 8 hours. At Bo, we found a place to eat as we only survived on what we ate in the morning. Glory to God I found rice which is my favourite meal abroad, Mike went for something else while Kille, a Sierra Leonean we had become friends with took the same meal with as myself. 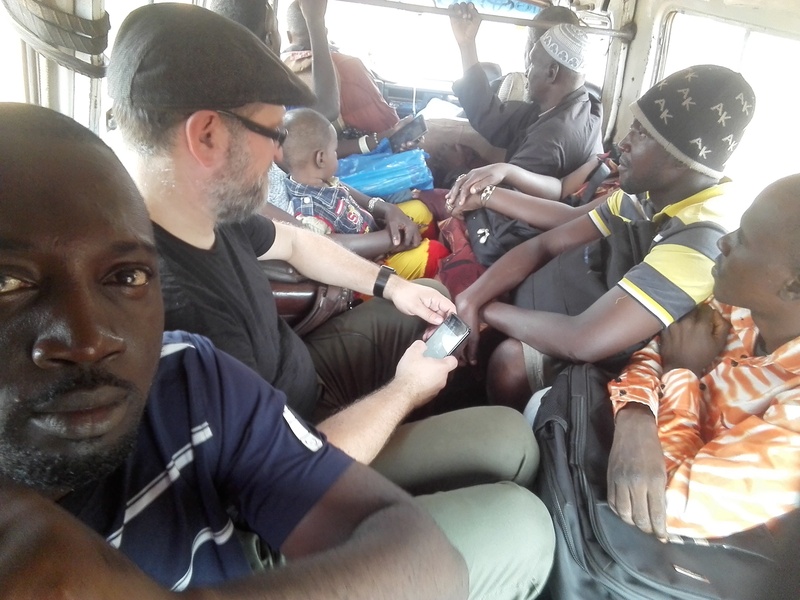 Kille was headed to Freetown while we were headed for Kambia. After the meal, we exchanged contacts and all left. We got another shared taxi from Bo to Kambia that evening. We paid around 25 dollars for the both of us on this trip. We had run out of Leones and the taxi guy would gladly collect dollars. We drove around another 4 hours or so to arrive at the border but on arrivals, we were informed by some security mena that the border was closed and that we must have to wait for the next day. It was at that point we had to go find a hotel. Before going to sleep that night, Mike told me he will come to wake me early the next morning and that’s what he just did. He continued knocking and whispering… “Ifeatu, it’s time to go…” I got up, asked him for a few minutes for take my bath a dress up. He told me he will be waiting for me at the hotel lobby. We were at the Kambia border at around 6:30am that morning. We were told that Mike could be passed but however, I will have to wait as the person who had the stamp to stamp my passport would arrive much later. They eventually got it all stamped after spending almost an hour there waiting and finding who it was who had the stamps. After these, we spent some amount of time in a particular office where a lady says they wanted to search us to be sure we are not taking away any of their precious solid minerals or diamonds. She requested for some bribe before she could let us go but we told her we had nothing and she could do her job if she wanted. She smiled and let us go. We walked over to the Guinean side of the building where their immigration had offices. There were lots of differences between these two divides – first of all, note that both were in the same building but the Guinea side of it was cleaner and nicer. Their officers were uniformed and they were more organised than the Sierra Leoneans. However, the language changed, currency changed and we also met some corrupt officers who wanted a bribe at all cost. Other countries we passed asked for bribes silently or secretly but these ones openly did. At a particular checkpoint, we were thoroughly searched to be sure we had no diamonds I assumed. From this side of Guinea, I always advice people to be very careful with whatever choice of transport they wish to take to Conakry or any other part of the country they want to go to. We initially wanted to use a shared taxi but the driver told us we would have to pay for two remaining extra seats in the vehicle. We were spending time there and yet, no one was coming. It was at that point I told Mike I would want to go look for an alternative as we had a flight for 2pm and we do not know how long it would take us to get to Conakry from there. Luckily, I found one. It was a 4X4 old range and it was cheaper. The driver said he was travelling to Mali to visit his mother and he needed to pick some passengers so he could offset the price for petrol. We jumped in and left but not without some quarrel and altercations with some of the Taxi Union at the park who argued we must go with the first person we met and wanted us to pay for the remaining space in his vehicle. We arrived Conakry at around 12pm or so that afternoon and we went straight to the airport, no time for sightseeing, no time to see friends. I noticed something about the city, it was not very developed like other francophone countries, even the airport looked a bit disorganized and ‘everyone’ wanted some sort of bribe. The city then was very hot and dusty with lots of red sands. I however loved the country because in the whole of West Africa, their passport happens to be the best as the citizens can visit most countries without a visa. They were also not using the conventional CFA used in other Francophonie countries but had their different Guinea CFA which exchanged at an exchange rate of one dollar to nine thousand Guinea CFA. We were in a hurry till we finally checked in. We were Dakar bound for a Microsoft Event the next day – “SPS Dakar”. We were more relaxed and now went to get a few things to eat at the airport. We flew almost an hour and some minutes before arriving at Dakar. Dakar was cool and beautiful. Coincidentally, several airlines from Europe arrived almost at the same time and we all queued up for the immigration formalities. The presence of several Europeans and the cool weather made look like Europe or America. We spend almost 30 minutes or so before we were eventually cleared and then, we now got to the scanner to scan our bags. Mike had scanned his earlier and it was now my turn. I was quite sure that my bag was almost out but was stuck by something, at that point, I reached out inside it to pick up my bag and that was how my problem started. The officials took me to a private room where they had me empty my bag and they searched every single thing inside it. In the room, I met several other people who were being searched as well. I noticed someone who spoke Igbo there as well and I asked him why they brought him there. He told me he was coming from Cape Verde and they supposed he had some drugs on him. He told me that one the contrary, he went for a conference and decided to come to Dakar to take a plane back to Lagos, I also narrated my own ordeal. While also these were going on, I was called in to go to another room where I was thoroughly searched. After the search, I was now asked to urinate into a cup and handover to someone who will have to run tests on my urine to determine if I had consumed some hard drugs or hard substances. In as much as I knew I was innocent, I was scared for two reasons. First, what if the food I took some days back which is not the conventional ones I eat contained anything they are looking for and what of if they make a mistake. Secondly, I have heard of some people have something stuck into their assholes so they could excrete something they had ingested. Honestly, I was not ready for any of those that evening as I was very tired and stressed out. While consumed with these thoughts, I heard calls from behind “… it is enough”. I was urinating into a cup they would use for the test and I was lost in thoughts. When I noticed the call that the urine was enough, I blatantly ignored them and gave them a full cup. They served me a mildly warm tea with lots of milk. I asked the young officer who gave me the tea I wanted some bread to go with it. He only smiled and told me I would be leaving soon. After the tests, they told me I can go but not wanting to go just like that, I called the young man to ask him a few questions. Why did you have to do all these, I asked, “… Ce la controle…” he responded. And I asked him to be more specific. When we saw I was determined to know why, even though I knew, he told me that that’s a test they subject anyone they suspect has hard drugs on him. He told me it was because I pulled my bag from the scanner. I thanked him and left back to the scanner the second time. This time around, I guess you know how patient I was for the scanner to do its work. I met Mike outside who told me he saw me from outside when I dipped my hands into the machine and he knew they would take me. We all laughed and we got a taxi to town! Mike at one of those points advised me that it would be nice if I would document my travels and experiences online, it would be cool and that was the first time I thought of doing this. Thanks to Micheal Noel for his advice and support. I’ll love to meet you one of these days. I love your adventures and your travelling experience. No worries David. Thanks for reading and your kind comments.